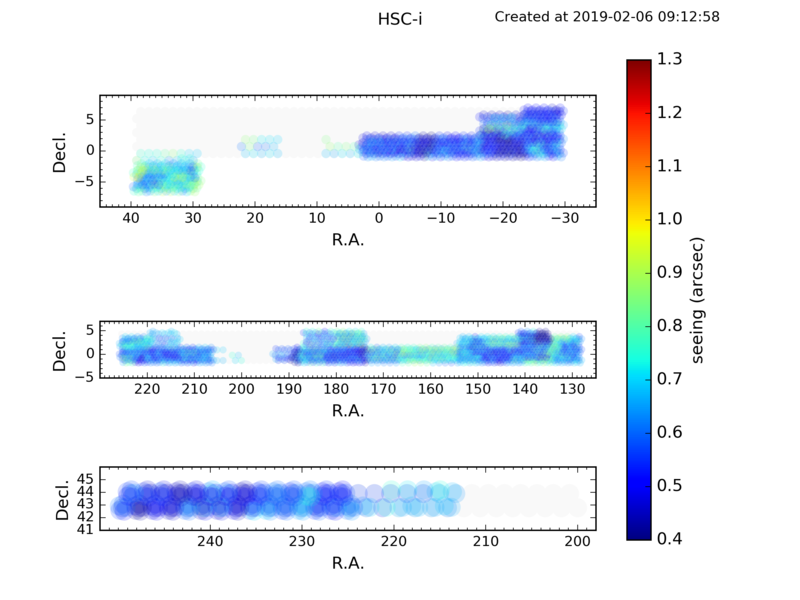 The Hyper Suprime-Cam Subaru Strategic Program (HSC-SSP) is led by the astronomical communities of Japan and Taiwan, and Princeton University. The instrumentation and software were developed by the National Astronomical Observatory of Japan (NAOJ), the Kavli Institute for the Physics and Mathematics of the Universe (Kavli IPMU), the University of Tokyo, the High Energy Accelerator Research Organization (KEK), the Academia Sinica Institute for Astronomy and Astrophysics in Taiwan (ASIAA), and Princeton University. The survey was made possible by funding contributed by the Ministry of Education, Culture, Sports, Science and Technology (MEXT), the Japan Society for the Promotion of Science (JSPS), (Japan Science and Technology Agency (JST), the Toray Science Foundation, NAOJ, Kavli IPMU, KEK, ASIAA, and Princeton University. 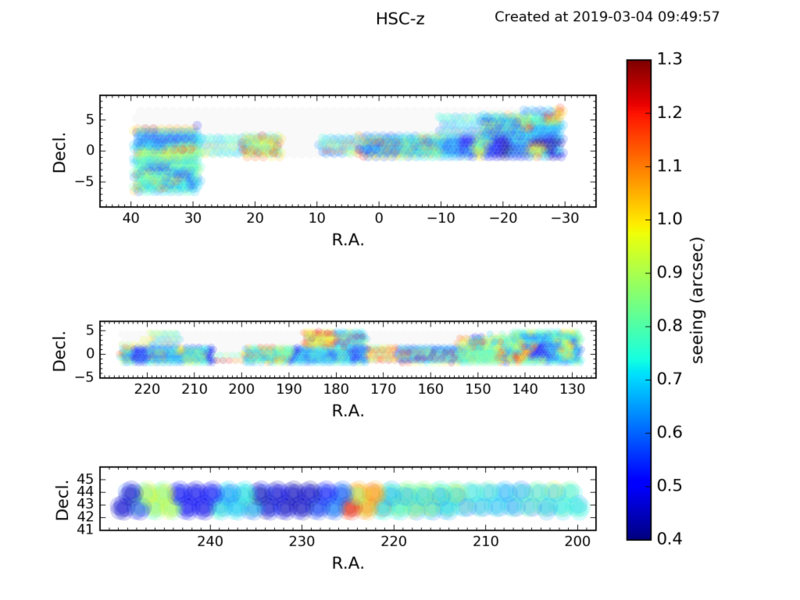 We are carrying out a three-layered, multi-band (grizy plus 4 narrow-band filters) imaging survey with the Hyper Suprime-Cam (HSC) on the 8.2m Subaru Telescope. Details of the instrument can be found on the instrument page, but in brief, the camera has 104 science CCDs covering a 1.5 degree diameter field of view with a 0.168 arcsec pixel scale. The delivered image quality is excellent across the field of view; the median seeing in the i-band is about 0.6 arcsec. 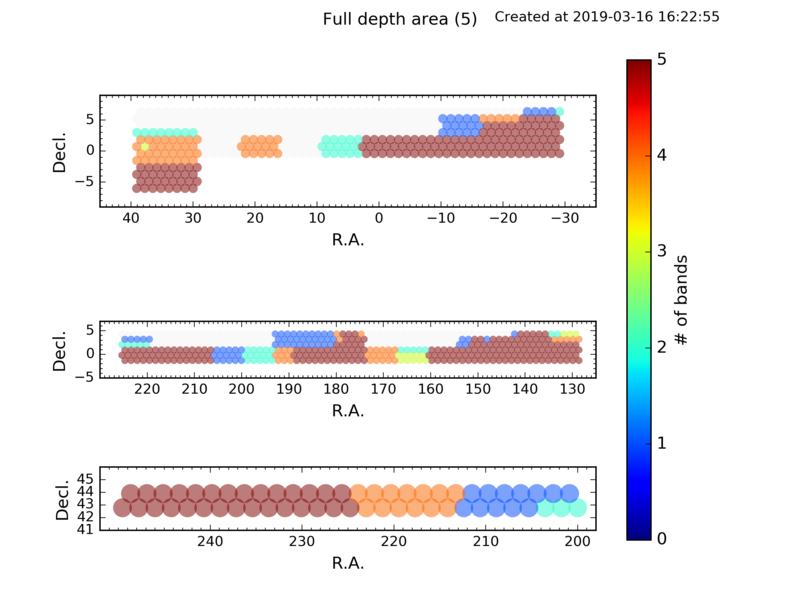 By combining data from the three layers (Wide: 1400 deg2, r~26; Deep: 27 deg2, r~27; Ultradeep: 3.5 deg2,r~28), we will address some of the most pressing problems in modern cosmology and astrophysics with a particular focus on grantational weak lensing, galaxy evolution, supernovae, and galactic structure. The survey is uniquely designed to enable various science cases, with particular attention to controlling systematic errors. The survey is awarded 300 nights over 5-6 years and it started in March 2014. For more details, refer to the proposal here. The nature, depth, and solid angle of each filter for the HSC survey were carefully determined to meet the main science requirements. The following table summarizes the filters and depths for each survey layer. Note that the exposure here is the total exposure time (e.g., g-band in the Wide layer is 2.5 min x 4 exposures = 10 min). Note as well that the limiting magnitudes are 5 sigma limits within 2 arcsec diameter apertures and they include effects of source confusion. The figure above shows our target fields along with the footprints of some of the major surveys to date. 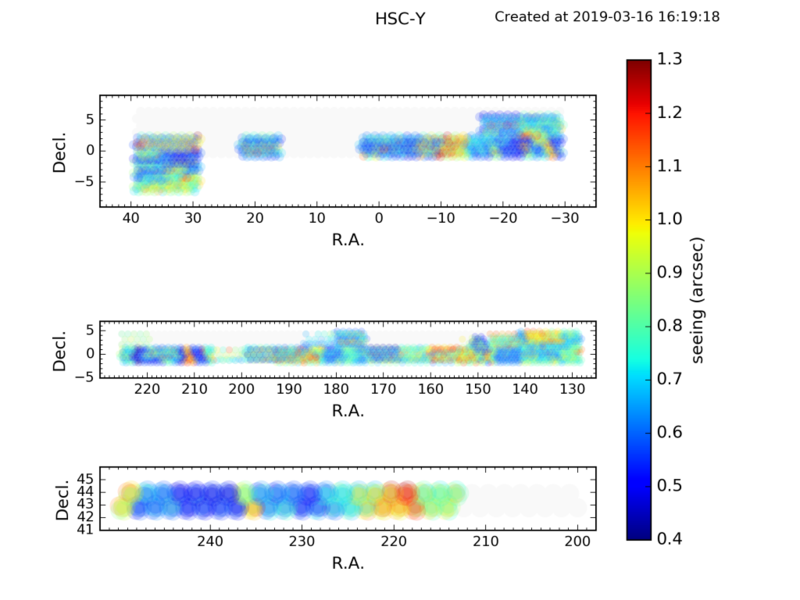 The HSC footprint overlaps the SDSS/BOSS footprint, because we use the SDSS for baseline photometric and astrometric calibration of HSC data. 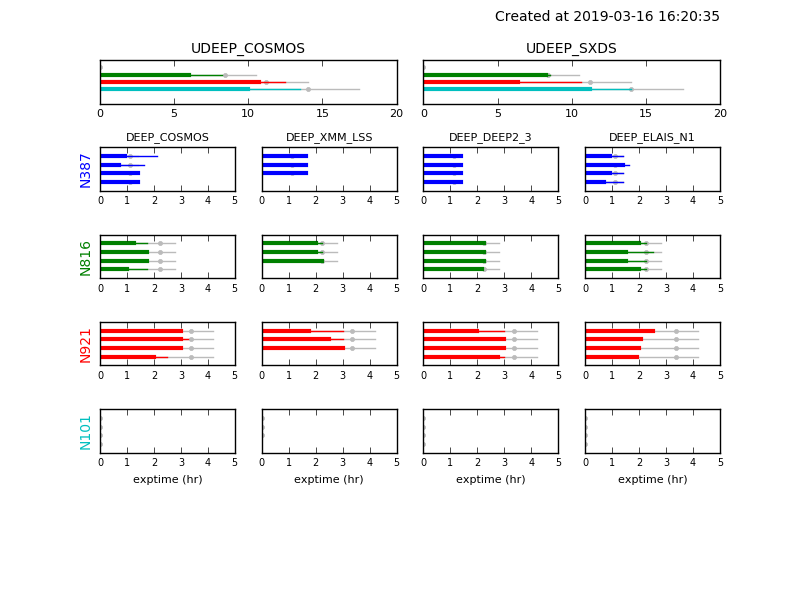 The BOSS data will provide a huge spectroscopic sample of galaxies up to z ~ 0.7, which will be used to calibrate photometric redshifts and the cluster-finding algorithm, and will be used for cosmological analyses. The fields overlap other multi-wavelength data sets to maximize scientific potential when combined with the HSC data. The major data sets which offer unique synergy with HSC data are the arcminute-resolution, high-sensitivity CMB survey by ACT in Chile, and its polarization extension ACTPol; X-ray surveys from XMM and eROSITA; near-/mid-infrared imaging surveys (e.g., VIKING/VIDEO and UKIDSS); and deep spectroscopic surveys (e.g., VIPERS, GAMA, COSMOS, HectoMAP). 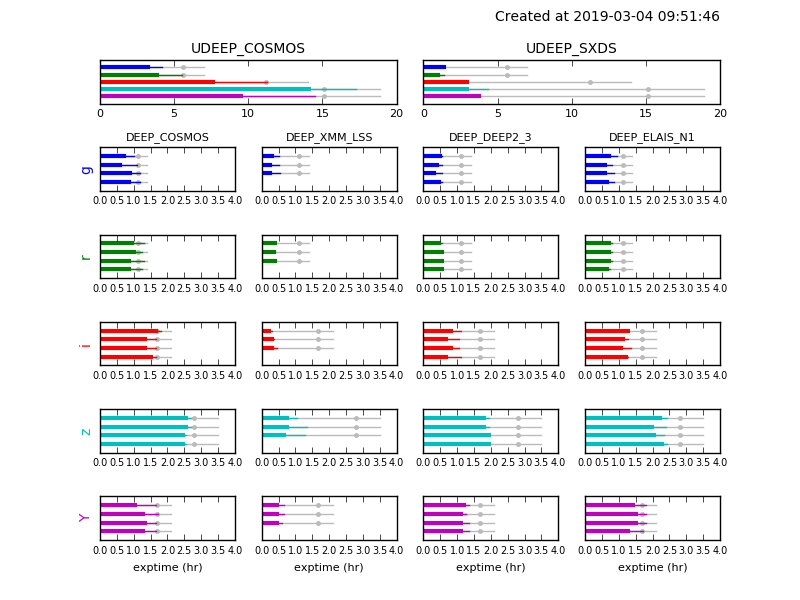 The Ultradeep regions are included in the Deep fields, and the Deep fields are included in the Wide fields. ELAIS-N1 is an exception here. The fields are chosen to be low in Galactic dust extinction. The figures show the area covered in the Wide survey color coded by the seeing. Note the excellent image quality in the i-band; the median seeing is about 0.6 arcsec! HSC Survey Committee: M. Chiba (Tohoku U. ), J. Gunn (Princeton U. ), M. Ouchi (Institute of Cosmic Ray Research, U. of Tokyo; chair of ultra-deep survey), K. Shimasaku (U. of Tokyo; chair of deep survey), M. Strauss (Princeton U.; chair of general survey design), M. Takada (Kavli IPMU; chair of wide survey), K. Umetsu (ASIAA). This committee is chaired by M. Takada, who has the responsibility and authority to make final decisions on survey design and management. AGN: Chair: Tohru Nagao (Ehime), vice-chair Yoshiki Toba (ASIAA). High-z galaxies: Ken Mawatari (Osaka Sangyo U.) and Yoshiaki Ono (U. Tokyo). Intermediate redshift galaxies: Andy Goulding (Princeton) and Masao Hayashi (NAOJ). Clusters: Chair Nobu Okabe (Hiroshima) and vice-chairs Yusei Koyama (NAOJ) and I-Non Chiu (ASIAA). Photometric redshifts: Atsushi Nishizawa (Nagoya). The HSC is collaborating with several external surveys to maximize its scientific outputs. 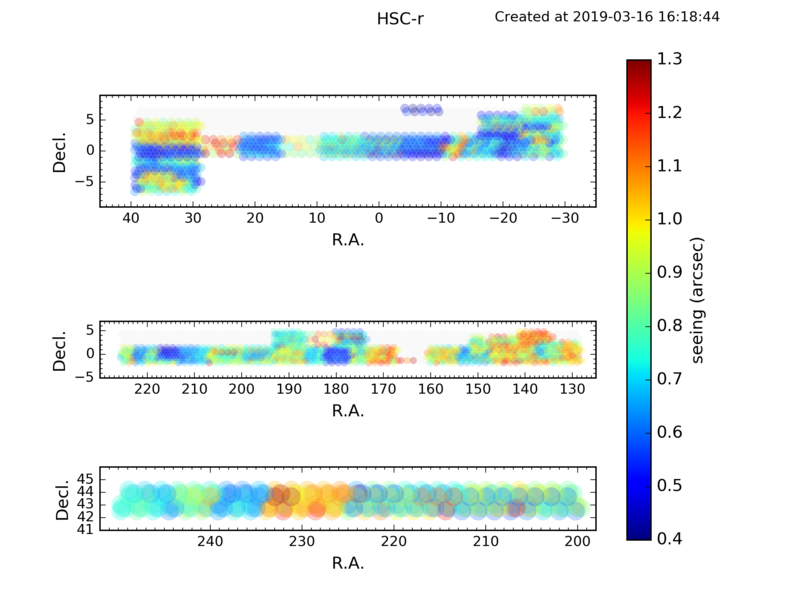 CLAUDS is a 350-hr u-band Canada-France-Hawaii Telescope (CFHT) campaign led by Marcin Sawicki (Saint-Mary’s University, Halifax), Stephane Arnouts (Laboratoire d’Astrophysique de Marseille) and Jiasheng Huang (CAS, China) and is covering 20 square degrees in the HSC Deep fields down to u=27mag (AB, 5sigma for point sources). 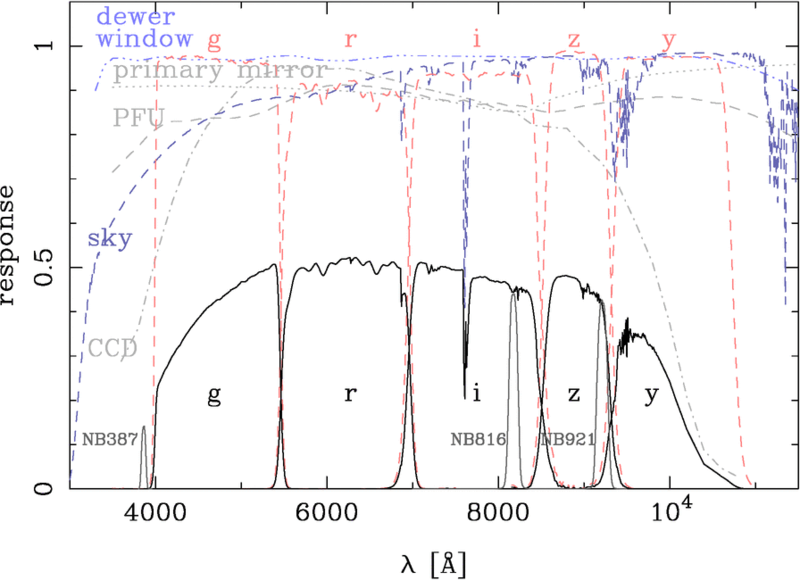 The addition of the u-band to the Subaru dataset allows the selection of star-forming galaxies at z~2-3, measurements of rest-UV SFRs at z<1, and greatly improves photometric redshift performance, key to almost all galaxy-evolution studies. The volume and depth of the universe we probe is enormous and will let us study the evolution of the galaxy population in detail in many slices of redshift, luminosity, mass (stellar and halo), environment and rudimentary morphology. The survey is expected to finish in 2017-2018. A UKIRT survey led by Steward Observatory (PI. Eiichi Egami) will observe part of the HSC deep fields over a total area of 7.5 deg2 in the J, H, K bands for a total of 240 hrs. The expected 5sigma point-source limiting magnitudes will be (AB) 23.6, 23.2 and 23.1 in J, H and K, respectively. The survey has already started and will finish in a few years. 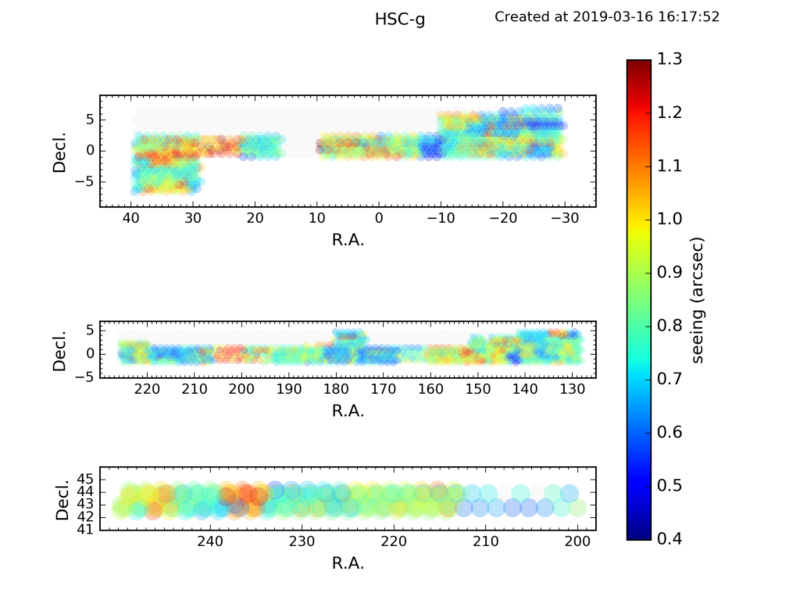 This program will measure physical parameters such as stellar mass and star formation rate beyond z ~ 1, and will allow us to identify high redshift (proto-)groups and clusters. In addition to these two collaborations, we have significant overlap with the UKIDSS and VIKING surveys that will help improve our photo-z performances in the future. We are planning a large spectroscopic follow-up survey with Prime Focus Spectrograph. A Subaru Strategic Proposal is being prepared. For details, refer to this site.